Former Deputy FBI Director Andrew McCabe might be able to save the pension he lost after Attorney General Jeff Sessions fired him. Several members of the House of Representatives have offered him temporary jobs that could allow McCabe to work enough time to save his retirement benefits. But former law enforcement officials have their doubts about whether this Hail Mary would work. When Attorney General Jeff Sessions fired FBI deputy director Andrew McCabe late Friday night, the 22-year intelligence veteran lost his pension two days before he was set to retire. Many lawmakers saw the Trump administration’s act as callous, and now four Democratic members of the House of Representatives have offered McCabe jobs in a last-ditch effort to save his retirement benefits. CNN estimated his pension at $US60,000 a year. McCabe maintains that the firing was actually because of what he witnessed after President Donald Trump fired James Comey as FBI director in May. So lawmakers are offering McCabe temporary gigs on Capitol Hill let him work a few days to be eligible for his pension, the Washington Post reported on Saturday. Rep. Mark Pacon was one of them. Other Democrats also chipped in their own offers for McCabe, a lifelong Republican, to work in various capacities to finish his term of service. “To Andrew McCabe: If you need a federal job, call me on Monday,” Rep. Luis Gutierrez tweeted. “I am serious. We have to stand up to bullies like” Trump and Sessions. 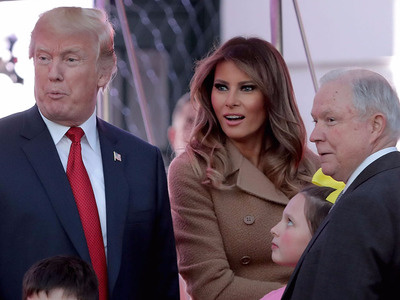 Chip Somodevilla/Getty ImagesDonald Trump, Melania Trump, and Jeff Sessions. But another former law enforcement official, Bob Ballentine, threw cold water on the suggestion on Twitter. Ballentine said that because McCabe was arguably fired “for cause,” he is not eligible to some of the benefits he might have otherwise received. McCabe was forced out of the FBI earlier this year amid an internal investigation by the Office of the Inspector General (OIG) into his approval of unauthorised disclosures to the media in October 2016 related to the bureau’s Hillary Clinton email probe. The Department of Justice inspector general reportedly concluded in a report that McCabe was not forthcoming during the OIG review. The FBI Office of Personal Responsibility then recommended that Sessions fire McCabe, even though he had resigned in January and was set to retire on Sunday. Ballentine, who specialises in counter-terrorism and criminal intelligence, said McCabe can and likely will challenge the reasoning behind his firing. Another former law enforcement official, James A. Gagliano,tweeted that McCabe would receive his pension when he hits his next age milestone at 57, and added that the bigger “damage” from his firing was the loss of his and his family’s lifetime health care and social security benefits. Amid these legal grey areas, McCabe’s spokeswoman Melissa Schwartz said the former FBI agent was open to all possibilities. “We are considering all options,” she told the Post.